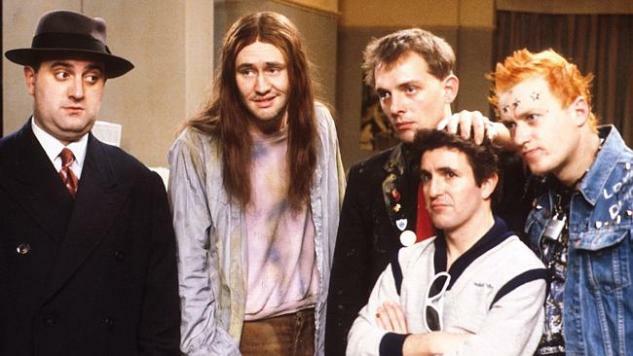 The Young Ones remains one of the most popular and enduring British sitcoms of the past 30 years, as it signaled the alternative comedy scene of the time finally breaking into the mainstream. Building off the manic and hilarious stage performances put on by Rik Mayall, Adrian Edmondson, Nigel Planer and Alexei Sayle, the show was a brilliant jumble of ideas, with each episode padded out with visual non sequiturs, plenty of fourth wall breakdowns, puppets, subliminal messages and a musical guest. And if having a band perform meant that The Young Ones could be considered a “variety show” by the BBC, and therefore receive a bigger budget, all the better. The most impressive aspect of the show’s musical choices, though, was how the producers ably navigated the expanse of the U.K. scene. They didn’t pander by bringing in the superstars of the day, nor did they get willfully obscure. Instead, they cherry picked from a diverse landscape of sounds, bringing in ska, pub rock, punk, world beat and a bit of proto metal for good measure. It befit the shaggy nature of the show and left some memorable impressions and catchy songs bouncing around the head of viewers on both sides of the Atlantic. The top spot on this list could have easily been a tie between the track that comes in at #2. But The Damned’s appearance on The Young Ones edges out Motorhead’s simply because the London-born punk band wrote an original song to accompany the episode where the boys attempt and fail to watch a “video nasty” (a banned horror film). Bonus points for catching lead singer Dave Vanian in full on big haired vampire goth punk mode. For a number of young people (including myself), their first introduction to the wonder of Motorhead was catching this episode of The Young Ones when it aired on MTV in 1985. You can imagine the seismic shift that took place in their souls when the terrifyingly awesome Lemmy ripped into the opening bassline and growled out his metaphorical views on hard livin’. Sure, it helped that the performance was intercut with the characters on the show acting foolish in a train station, but if this clip didn’t send you rushing to your local record shop to buy a copy of No Sleep ‘Til Hammersmith, you weren’t really paying attention. Founded by former Pop Group members Bruce Smith and Gareth Sager, Rip Rig + Panic took not only their name but their spirit from the late Rahsaan Roland Kirk, the jazz musician that sent pop standards into the stratosphere with his wild sax playing and African-inspired arrangements. As this clip proves RR+P had an even more pop sensibility in mind but were also capable of tearing it up onstage with body rocking energy and attitude. In other words, the perfect band for the gang’s ill-fated house party. By the time Dexys Midnight Runners appeared on The Young Ones, the West Midlands outfit was fully into their shabby chic stage, as the U.S. would see in full bloom on the video for their #1 hit “Come On Eileen.” On this show, tucked into an episode where the boys find an unexploded atom bomb in their kitchen, the tattered overalls and fraying sweaters looked even more incongruous. That thankfully didn’t diminish from the bracing joy of their take on this Van Morrison classic. The conceit of this episode of The Young Ones is that the boys are too wrapped up in their own heads and their complaints about being bored, that they’re missing out on all the weird and delightful stuff happening around them. That includes a poorly mimed but still enjoyable version of the double entendre-filled tune from Madness that wound up being the popular ska-pop group’s only #1 single in the U.K. You also can’t be the small moment towards the end of the band’s appearance when lead singer Suggs threatens to smash Rik’s face in.